Oof. Scary one there. Almost disturbing... not sure why. R.Lee Ermy was great in everything he was in. 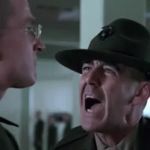 I think Full Metal Jacket was his best and I don't know how many times I have quoted him out of that movie. I may be biased though, and that was the first movie I saw him in. I saw this gif a while back and since it was parallel to the original post, I figured I'd add it. "Pyle, get the f#ck off my obstacle!" Not sure, I'd have to watch the movie again. Huh? Are those official Marine Corps abbreviations? Wait a minute, Slim. You're a U.S. Marine... ain't ya?